YOU could easily fall into the belief that hybrids are more of a fashion statement than they are a functional car that can save you money while still delivering on performance. So what happens if you were to actually put that theory to the test. In this case we are pitting the 2018 Mitsubishi Outlander 4WD LS against itself, comparing the 2.4-litre petrol version with the Plug-in Hybrid Electric Vehicle (PHEV) variant. Let’s face it, your average environmental warrior owns a hybrid, and they’re smug about it. They like to remind people they’re driving a hybrid and some would even say hybrid drivers are fast becoming the vegans of the motoring world; their brains filled with nuggets of information for fossil fuel vehicle owners, about why they should ‘go green’. Well hold on to your Jesus bars petrol lovers, because in case you haven’t been paying attention to stories about Audi, Jaguar and even Hyundai building a swathe of hybrid and full electric vehicles, things are about to get real, very, very real. Firstly, let’s take a look at what you get. 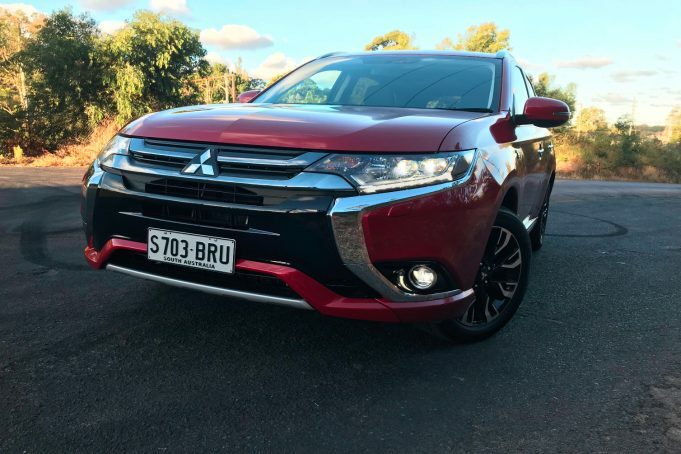 The 2018 Outlander range has a strong, well designed, look and feel, and while there are slight differences between the LS petrol version and the PHEV, they both deliver a nice street presence and a sleek yet aggressive stance with a good amount of shiny bits. Both present with nice 18-inch allow wheels, with the petrol model getting halogen headlights and LED fog lamps, while it’s all LED on the PHEV, with a rear wing on the lift back door and some really nice colours added to the range. 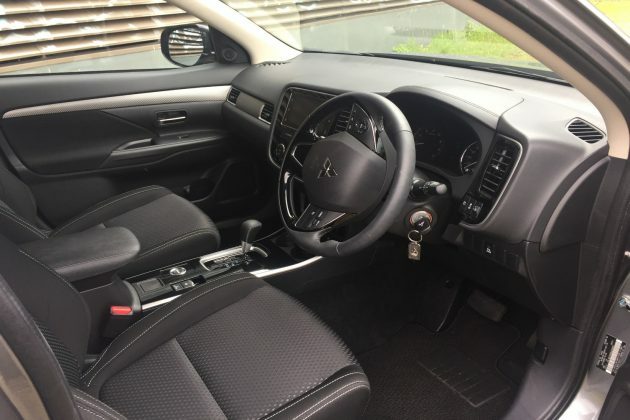 Inside too it’s pretty much the same with a black interior in the petrol and a mostly grey version in the PHEV. 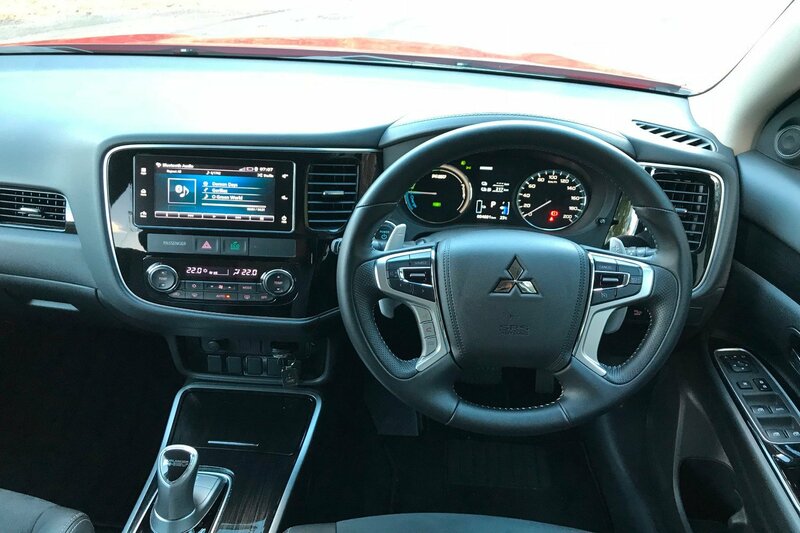 The same 7-inch touch screen infotainment system is present in both models, with Bluetooth, Apple CarPlay, Andriod Auto and two USB ports. Both are fitted with six speaker sound systems, and both include the leaf-based driver efficiency rating system. If you don’t know about the leaf rating system, it works like this; every time you turn the vehicles off the last thing you see on the console is a rating of how efficient your drive was, communicated by way of a five leaf twig thingy. The more leaves that are green, the more Mother Nature will love you, and the more your personal smug level will increase. 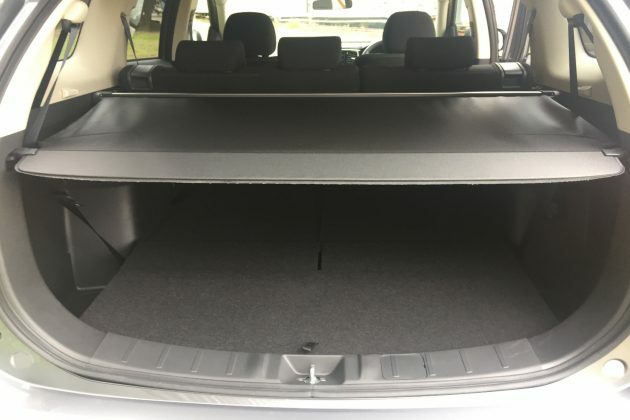 Seats are all standard manual operation, with a good amount of room in both the front and rear of both vehicles, although the LS petrol does have two more seats in the boot area that can be folded out to create a 7-seat vehicle, but it comes at cost. 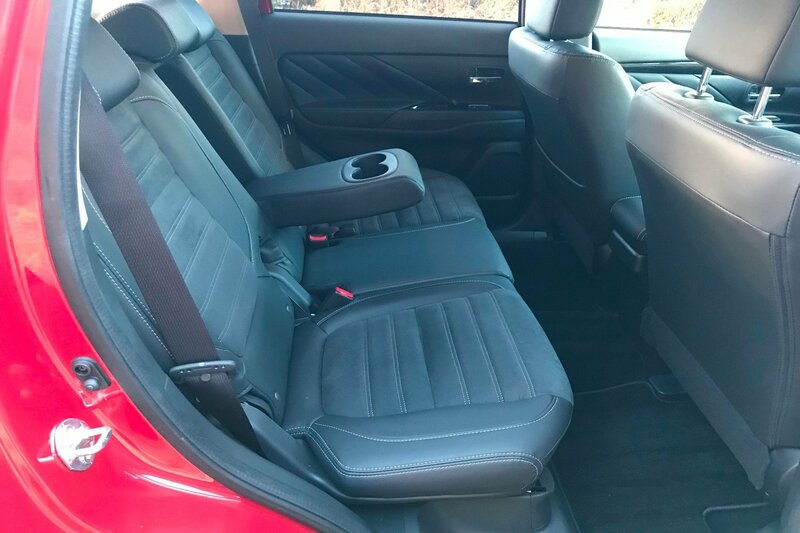 Set the third row seats in the upright position and you’ll need to slide the middle, or second, row forward to give occupants in the back any leg room at all, and if you’re tall, your knees will be in your chest. 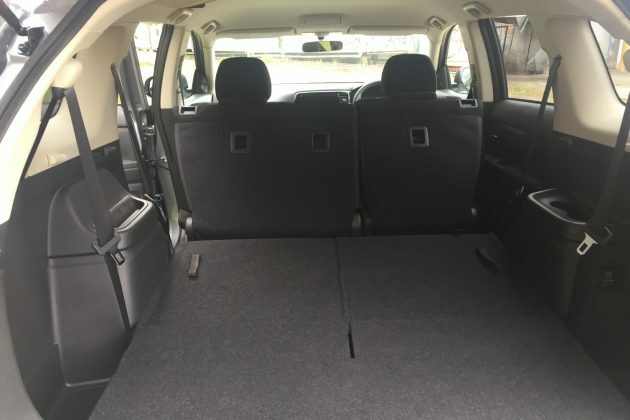 In reality, the rear seating is only suitable for kids. There’s also nowhere to hide the cargo blind when row three is up. While we’re picking out things that we didn’t like, the driver’s air vents are quite possibly the most annoying aesthetic thing in the entire car. They are both mounted on an inward angle, so no matter how much you turn them away from your face, they will constantly blow on you, and there’s no option to turn them off individually. It’s a little thing right, on first impressions, but over time, would it drive you crazy. 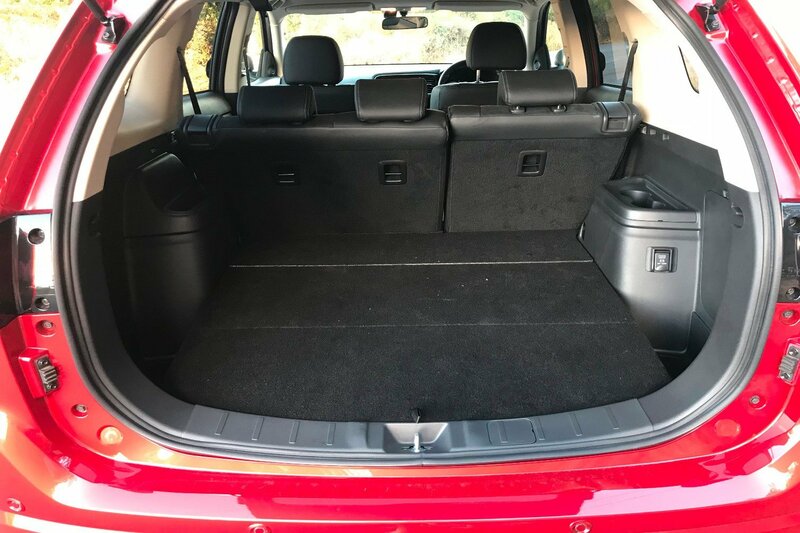 There’s great boot space across both variants though, at 470-litres (or 128-litres with the third row seats upright in the LS petrol), and there are cup holders as far as the eye can see (and we love cup holders). There’s also a bevy of seat pockets, and lots of little hidy holes for kids to shove half eaten sandwiches and spent apples. The LS petrol gets a space saver spare but the PHEV is a different story. It only comes with a bottle of goo that you put in the tyre if it’s just a puncture, and a supplied compressor which allows you to pump it back up and run to your nearest tyre joint to get a repair done (not unlike what BMW does with its M cars). Now here’s where things change direction. Drastically. 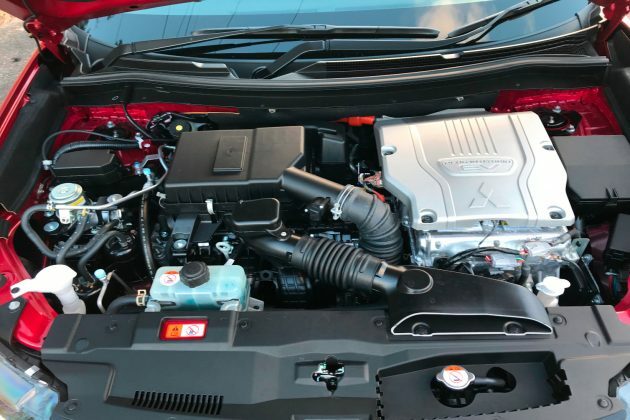 The LS, with its 2.4-litre four cylinder SOHC 16-valve MIVEC petrol engine married to a CVT gearbox, is without doubt the worst choice to have in a car this size. It’s grossly under powered. This leaves us immediately questioning why manufacturers continue to put little engines in big cars, and then marry them to a gearbox not designed to enhance power delivery. Why car makers? Why? It’s revvy, and because it lacks power, you have to drive it really hard to ‘compete’ with the cars around you. Kiss the claimed 7.2-litres/100km fuel consumption numbers goodbye right now, because they’re gone. If you were to try and maintain that figure, you’d have to drive so slow you’d be passed by mobility scooters. As an aside, we do know that Mitsubishi offers a 2.2L diesel in the LS and Exceed variants. Without having driven that model option, we would guarantee it’d give you more power and better fuel economy. That said, the super select 4WD is great and performs well on unsealed rough roads, but wouldn’t allow you to do sand or anything serious off road. Though it is under powered, it does handle both city and freeway driving with ease and is easy to park with the assistance of rear facing camera and parking sensors, so handling good, power bad. Then there is the PHEV. As soon as you press the start button your motoring world changes. Apart from the clicks of a few relays and a noise like a computer starting up there is nothing, and you only know it’s on because it tells you it is. It’s strange at first, but after a few days of driving, it becomes satisfying not having to hear an engine running. Once you have located Drive on the slightly confusing drive selector and have released the electric park brake your ready to go. And jeepers creepers does it go. When you push the accelerator in a traditional petrol powered car you pull a cable, which feeds more fuel into the engine, which revs faster, and turns a torque drive, which engages gears, which drives a drive shaft, which turns the wheels. You know the knee bone is connected to the shin bone, the shin bone is connected to the… (you sung it didn’t you). 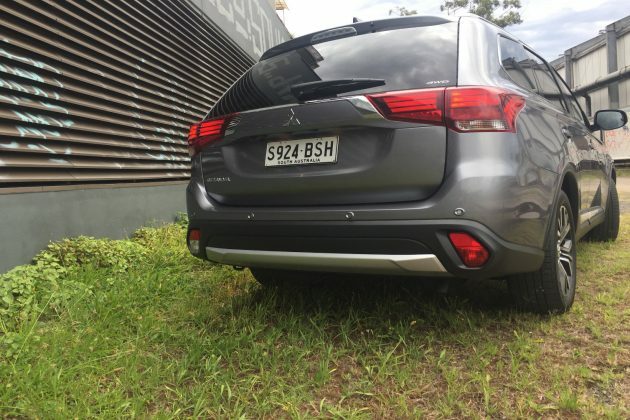 There’s none of that in the 2018 Mitsubishi Outlander LS PHEV; you push the accelerator, an electrical signal is sent to a computer which then talks to the electric drive motors and off they go. The response from your foot to movement is instantaneous and again, apart from a slight humming, it is completely silent. It also seems like the power is endless; no gear changes, no lag, no nothing, just power when you need it. It’s such a joy to drive that we found ourselves making excuses to take it out, and while driving it we were constantly saying things like “wow”, “so different” or “awesome”. It’s an experience that is unlike any other. So this particular hybrid is slightly different to some of the others on the market, in that it offers a completely electric mode where it only uses the batteries. The engine won’t kick in unless the battery runs low or your stomp on the pedal for to long. You can charge it at home via the supplied plug in charger that goes straight into a standard 240v power outlet. It will take about 6.5 hours to give you a full charge, or you can charge at a charging station, if one is available. If you can access a supercharger station, you can be fully charged in as little as 25 minutes. So the burning question now is, is it worth it? Does it make a difference to the wallet and environment? Well, based on standard electricity rates it cost about $1-$2.50 to give it a full charge and you get about 50km out of that charge. So with some basic maths and current electricity prices that figures out to be about $5/100km. Compare that to the 2.4-litre petrol option, which equates to about $10.50/100km based on current ridiculous fuel prices. Those figures are accurate for the PHEV if you are running totally electric; charging it up at night and not doing anymore than 50km before you charge it again. 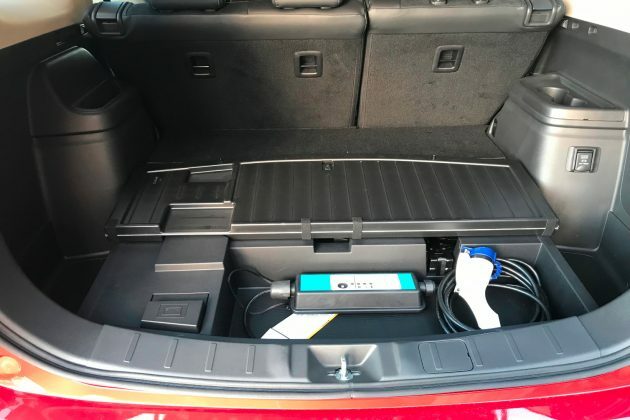 But plugging is not the only way to charge as you can set the car to recharge while driving or to save the battery for when you want to use it later. 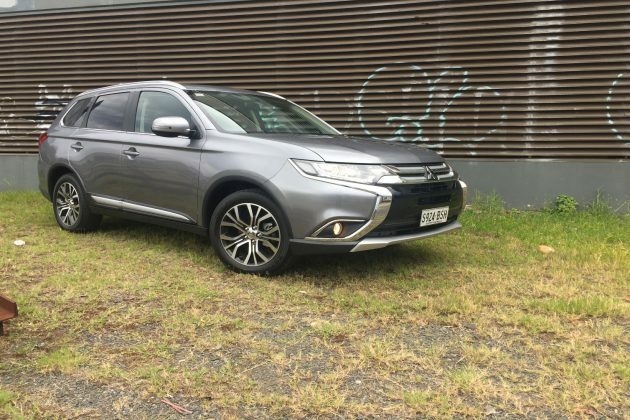 The PHEV has two electric motors, one on the front wheels and one on the rear, while the 2.0-litre engine can charge the battery via a generator on the fly, or it can direct drive the front wheels as well. This combination gives a combined total economy of 1.7-litres/100km. It’s madly efficient and switches effortlessly between modes. To give that some perspective, out of one 45-litre tank of fuel, you’ll get close to 2,500km if you drive it efficiently. So is it worth it? Freaking oath it is. If your day to day car usage is a drive to the station or a short drive to your workplace you can get away with using no fuel at all and that means no environmental impact apart from the minuscule amount or power it takes to charge. When the weekend comes you have a vehicle you can fit the family in, go long distances without refuelling, and even handle fairly rough roads to boot. All that and you can tow a trailer with it too. There is a sting in the PHEV though, and it’s in the purchase price. For the basic LS 7-seater petrol Outlander you will have to part with $38,990, or pick up a 5-seat version for $27,900. The top of the range Exceed is $46,990. The 2018 Mitsubishi Outlander LS (petrol) comes in White, Starlight, Black, Red, Sterling Silver, Ironbark and Titanium. The LS PHEV is $50,490. There is an Exceed option too at $55,490. It is only available as a 5-seater and comes in just four colours, White, Red, Titanium, and the very swanky Ruby Black. 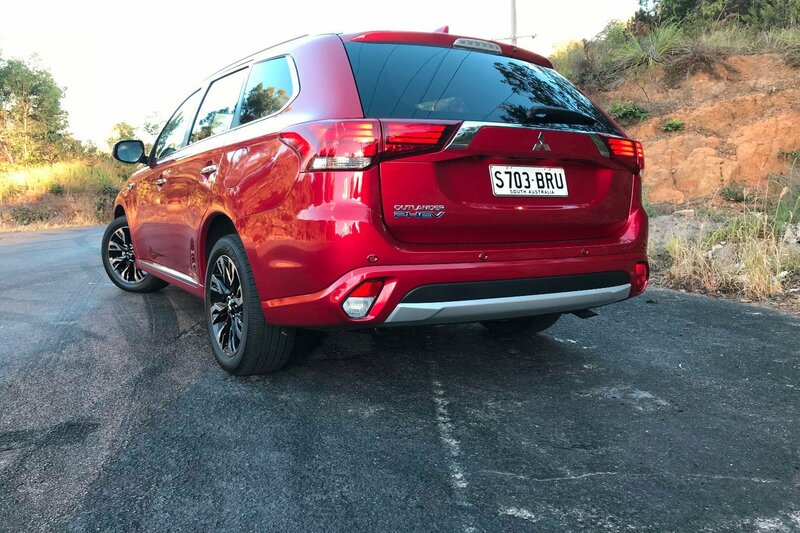 Our 2018 Mitsubishi Outlander LS (petrol) and Outlander LS PHEV were supplied by Mitsubishi Australia. To find out more about either vehicle, contact your local Mitsubishi dealer. NB. 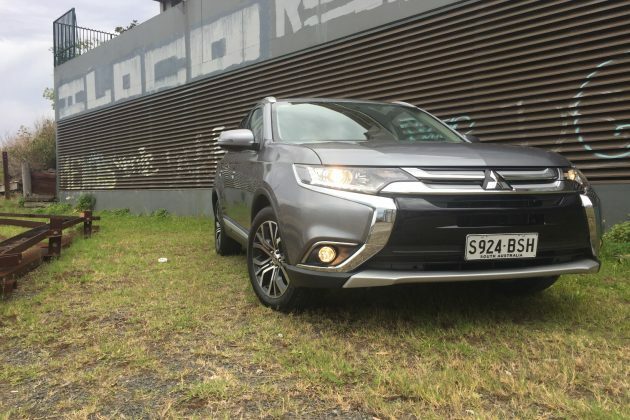 our ratings are for the PHEV variant, which scored a 4.2 overall. 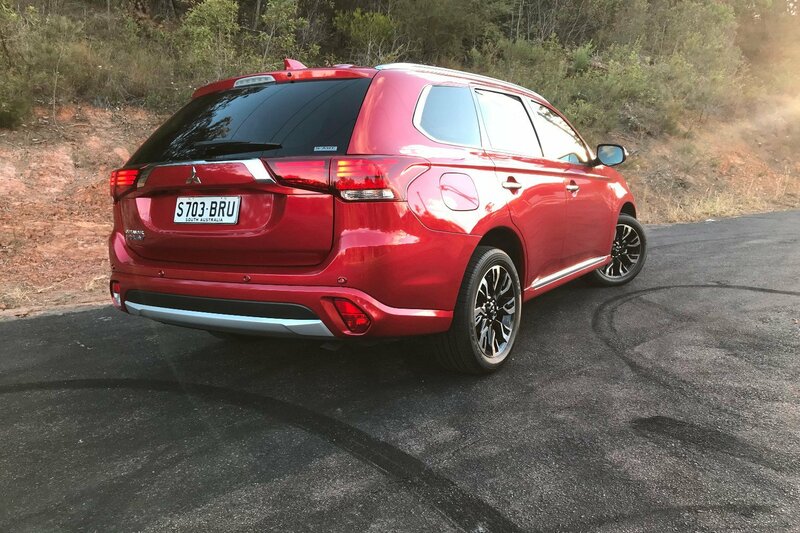 The LS 4WD (petrol) model scored a 3 for Driving Experience, giving it a total of 3.8 overall (all other scores were the same). Pros - exceptional fuel economy; fantastic drive; good looking car. Cons - low battery capacity; driver's air vents; no spare tyre. Ben Bonatesta is a genuine lover of nice things and quality workmanship. He also has a thing for stuff that isn't practical, but has that wow factor. A frustrated creative writer, Ben has a varied work history that has allowed him to pilot everything from top of the line sports cars to dirty old work trucks, farm equipment, and even trains. THE wait is over. Confirmation has come today that the new 2018 Ford Mustang will arrive in Australia mid-year, with a more athletic look, improved capability, and technology inspired by Ford Performance’s Le Mans and Daytona-winning GT racers. V8 Supercars dead. Supercars Championship rises.